"The Ecology and Evolution of Ant-Plant Interactions" by Victor Rico-Gray and Paulo S. Oliveira. I started reading this book yesterday and I'm thrilled so far. I was expecting this book to focus heavily on Pogonomyrmex, Harvester Ants, and Atta, Leaf Cutter Ants. To my surprise though they are only really talked about for the second chapter. So the book is 9 chapters long what could they really talk about? Reading on I find they other chapters focus on ants as a primary seed dispersal. So I'm thinking okay this is going to just talk about voilets and trilliums, which they do for the post part. But they end this chapter with a list of plants ants disperce the seeds of! Trilliums, some Violets, Wild Ginger, Blood Root, Bleeding Hearts (which is a big surprise to me!) 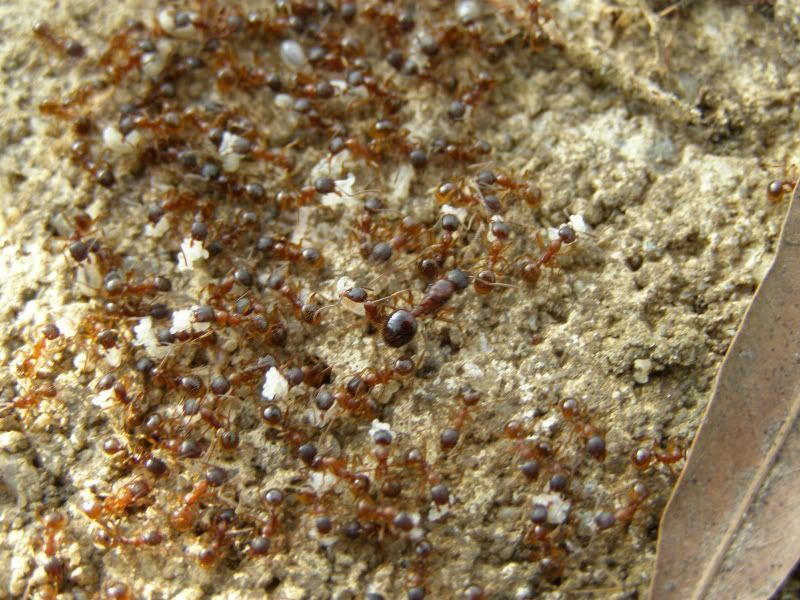 all use ants to disperce seeds. The list goes on but but many of the plants are not in my area and I'm trying to keep the garden as native as I can. What's interesting about this is the coating around the seeds that attracts the ants is fed to ant larva. And as it turns out this will change worker brood into queens. Thus colonies that work these seeds as a food source will produce more queen ants to make more colonies. When I get a few colonies going and have these plants I'll have to keep an eye on this behavior. Normally captive colonies don't produce reproductives. The book goes on to name Ant Genera that disperce seeds. Probably most surprising is that Prenolepsis, Formica, Camponotus, Lasius, and Myrmica will plant seeds to these plants. Later chapters of this book show Ants as a pollinator to some plants. Mostly plants growing in dry conditions and that have very small flowers. Generally any small insect will work as a pollinator but it's good to know ants contribute here. Some much needed rain last night gave me hope that Prenolepis imparis would fly. However all I found today were Camponotus castaneus workers out foraging. Though normally a nocternal forager they may still be seen on cloudy days. They normally nest in semi sandy soil around trees. The nest itself is located around the tree roots while the entrance is uaually a few feet form the trunk. They may take advantage of rocks and logs too but rarely build up into them. Unfortunantly I've never been able to get queens of these to be successful. Boosting with pale workers seems to help. I say pale workers becasue Camponotus lay eggs in batches over the year and colonies don't always have cocoons to boost with. 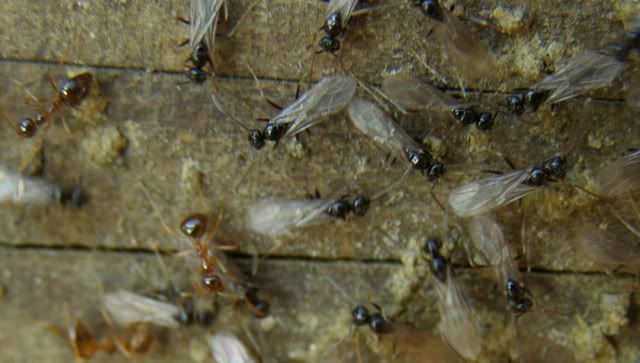 Pale workers are uaually a sign that they're less than 4 weeks old so the colony odor hasn't taken them yet. 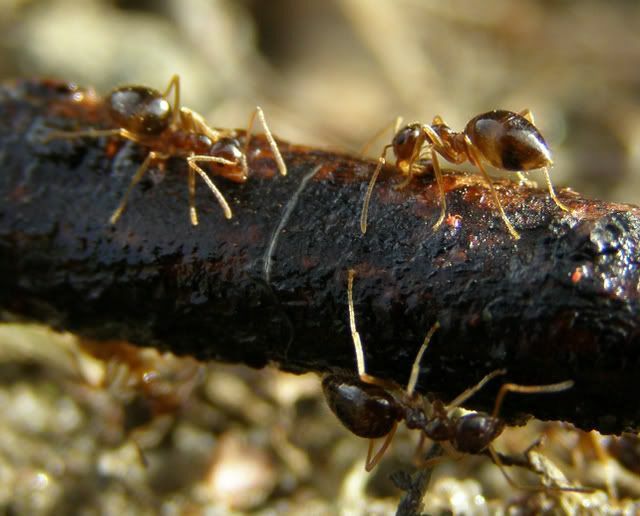 Such young workers rarely attack other ants, especially queens of their own species. Something we didn't realize when recording is Myrmecocystus and Pogonomyrmex are currently flying. 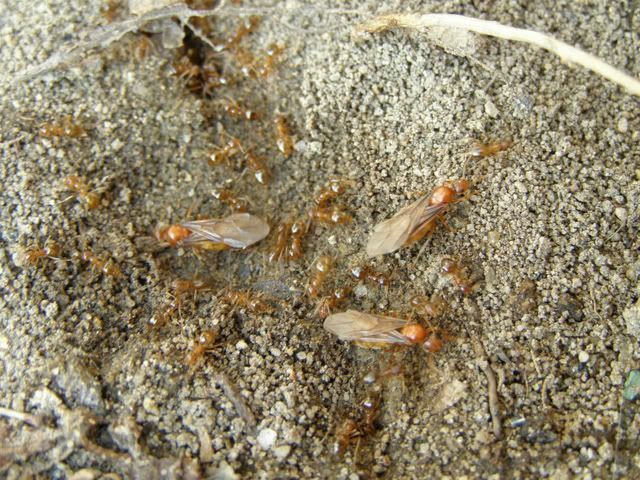 These are western ant genera with the exception of a single Pogonomyrmex species found in southern states (Florida, Georgia and serounding area). Colonies are warming up and a few have even flown. The season for all things ants has officially started. This is also the ideal time to catch colonies! Pictured above is an Aphaenogaster colony, queen present in the middle, that was under a rock out in my yard. I've had a few opportunities to catch assorted Formica colonies this way too, and even the nomadic Tapinoma is emerging. Some Myrmecocystus are flying out west I believe along with Prenolepis imparis where found all over the countrie. I've caught a single queen so far this year and she's already produced eggs. Termites here in NJ are producing alates (winged kings and queens) and will be flying probably sometime in April or May. As I recall they do so either in the early morning or around noon. When swarms aren't eroupting inside homes they can be found by their gleeming wings in the sun. Birds and very active Formica are another good sign of a flight. Locate wondering pairs and catch them both. Test tube setups and clustral cells work with termites but I believe they need soil in their container along with small bits of dead wood and grass. Is Ant Chat to Floral? So I'm the host of Ant Chat along with Cody who hasn't been on the past few shows. But we keep in touch. Recently he was listening to a lot of the shows and said that it's way to floral. I'd like to address this now. Yes a few of the shows have almost nothing to do with ants. The truth is I'd just like to turn it into a nature show with emphases on ants. And I talk about plants because it's so important to step back and look at what you're doing now and then. If the show were just about ants, it would consist of catching queens, digging up colonies and keeping them. There's a slight undertone there that nature is there for us to take advantage of, and I don't like that. Yes I do catch queens which doesn't do a whole lot to the environment, I dig up colonies to common species which doesn't do a whole lot either. But the thing is there are people who take this to all new extremes. They find a swarm of ants and catch several hundred queens to one species. Catching so many queens of one species definitely puts a dent in the environment and I would only say it's ethical if this is done by a scientist or if it's a nonnative or invasive species. What are you going to do with 100 Lasius neoniger queens? For people who buy exotic ants online, this is illegal in most countries but not commonly enforced. But let's ignore that issue for a moment. If you can't keep the ants alive locally to your area, what makes you think you can keep something more advanced? I'll be addressing some of these things in future shows. So I'm trying to inspire people to make the world a better place. 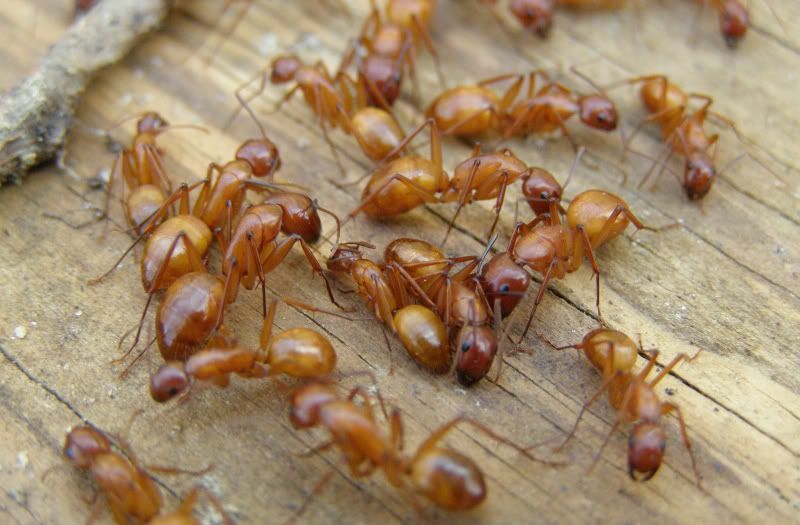 There are reasons invasive ants are commonly found in your backyard. The image of that "golf course look" is one of them. 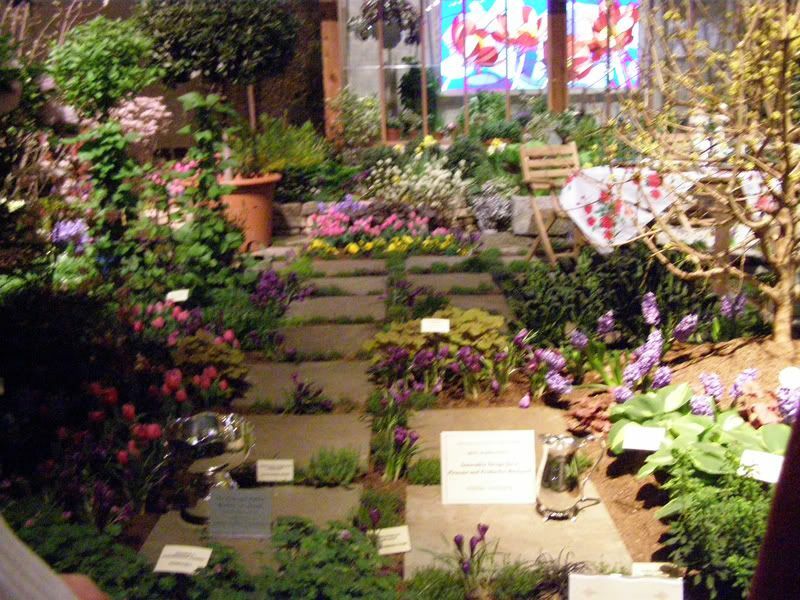 For at least 200 years now we've been holding flower shows and competitions for good landscaping designs. 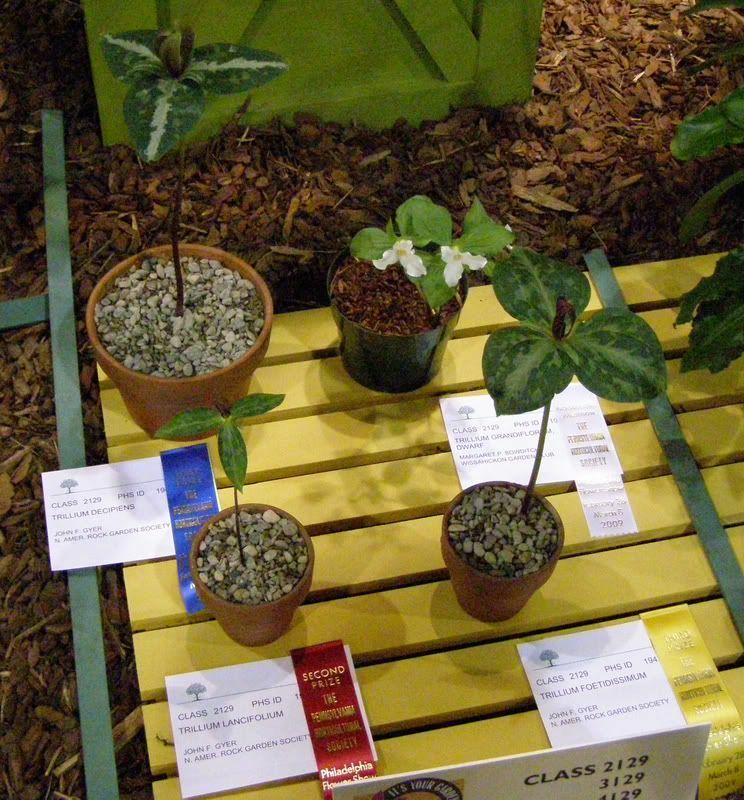 People using foreign plants tended to win these because they competitions because they had something unique. 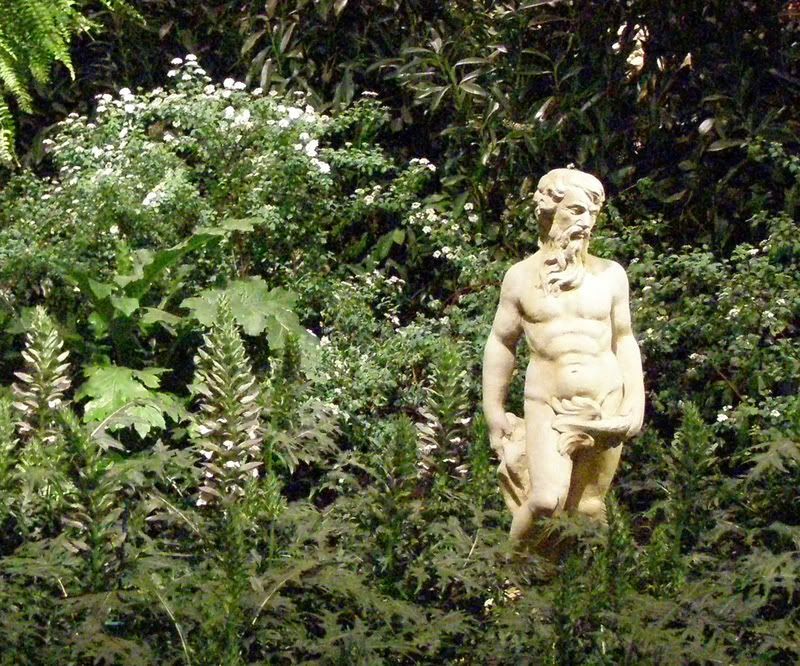 These unique plants were loved and adored and people bought them on special order to make their landscape stand out. Eventually entire tree farms were devoted to nonnative plants and cultivars of these are mass marketed. 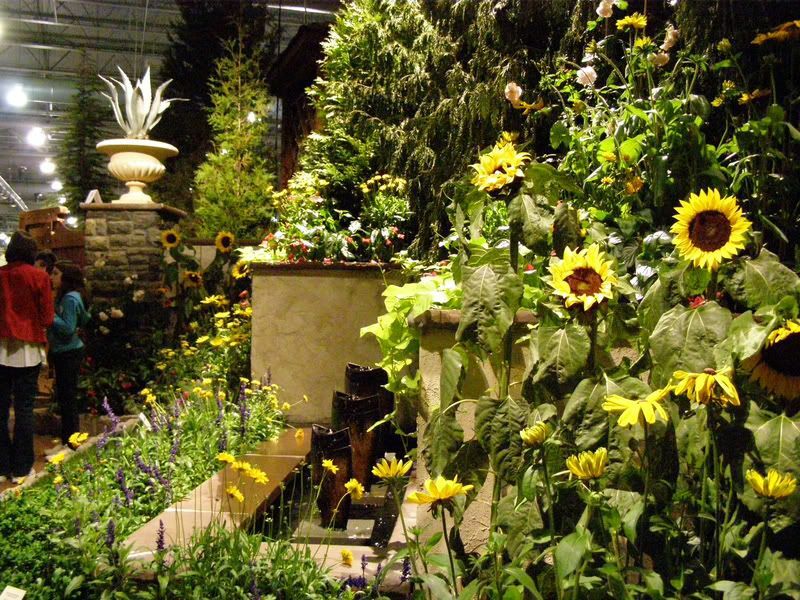 Going to any garden center today I would say less than 5% of the plants there are native to the US. 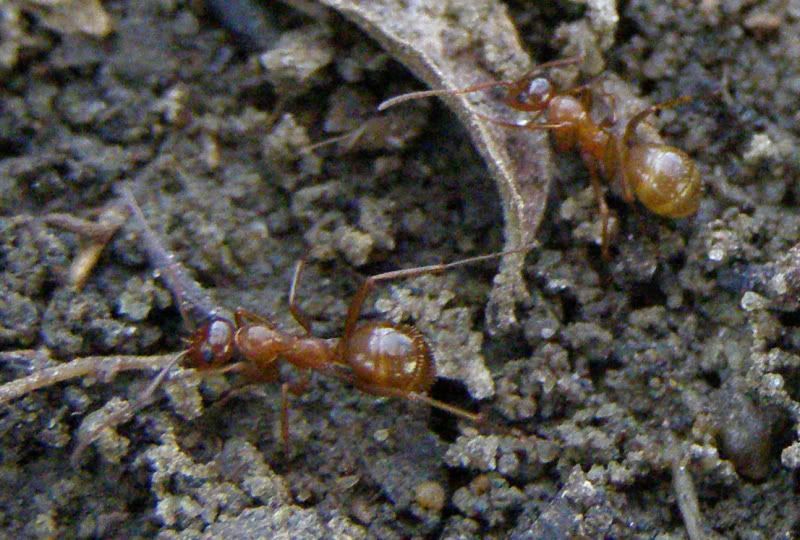 When exotic sod (look at your front yard) was imported from South America it brought with it the invasive Red Fire Ant, Solenopsis invictia, which has decimated a huge chunk of ant diversity in southern states of the US and other countries. The Argentine Ant, Linepithema humile, likely came over with potted plants along with over 100 others nonnative species. 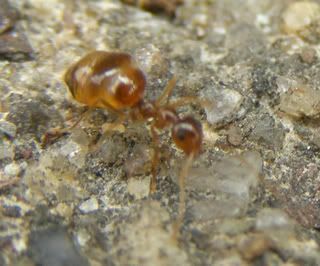 Tetramorium caespitum is from Asia and no one knows how it got here but the pavement ant is commonly found in grass or along sidewalks. Myrmica rubra is from Europe and slowly taking over forests in the American North East. Monomorium destructor (The Destroyer Ant) is another invaisive in urban areas but isn't a horrable mennace yet. Where found though they've been known to remove protective rubber layers electrical work and phone lines and can nest in fabric. So I like to talk about plants on the show in the hopes that I inspire a few people to improve their landscape. 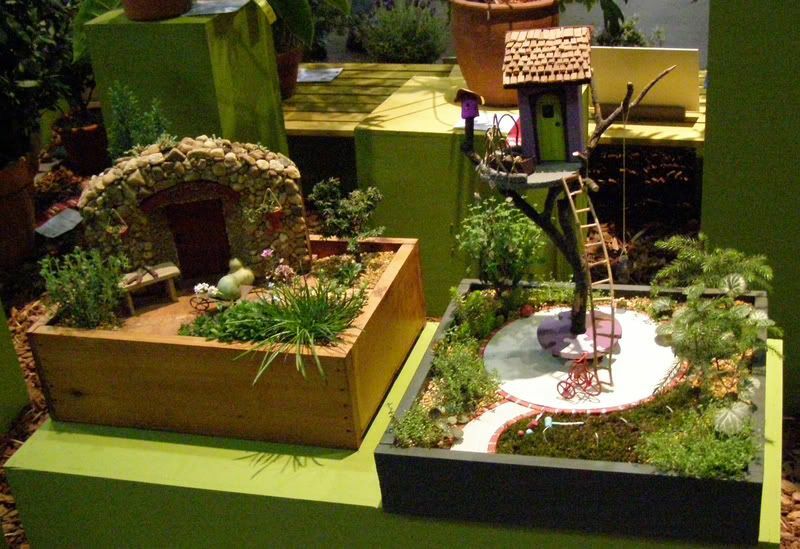 But it's hard to recomend native plants just for ants though. There are so many other benefits to these. Milkweed, Asclepias, is the host plant to the Monarch butterfly. But when they die back in the winter the stems are ideal for small colonies of ants to move in. Goldenrod, Solidago, is another one they can nest in but it's also a host plant as well very beneficial to pollinators. There are loads of plants ants will nest in the stems of. Some ants are specialized predators of caterpillars. Leaving dead wood around to decompose is greatly beneficial to the environment. Dead branches and trees also work, and if they're to far from anything to cause property damage don't need to be cut down. The ants and insects that normally take advantage of these will attract woodpeckers and offer a great spot for a grape vine to grow up. The problem with this issue though is that I need time in order to show this benefit of gardening. One has to look at success in terms of years. Relandscaping your entire yard into a native plant paradice probably won't remove the nonnative ants form your area. 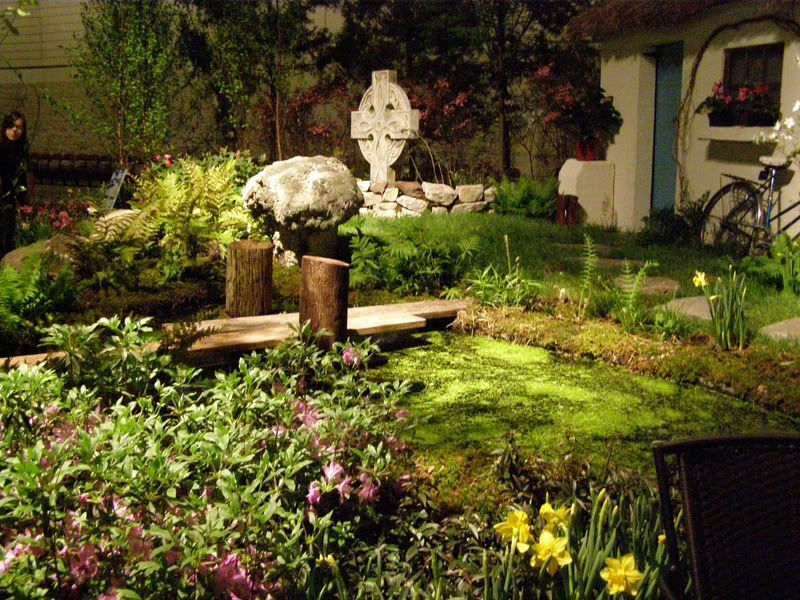 But it will attract native ones to come in and eventally hopefully increase the biodiversity of your yard over a number of years. Today is the first day of spring, believe it or not. The day opened with a 1/4" of snow. It melted quickly though and the rest of the day was in the low 60's and 50's. Plants have started to arrive that I ordered from various places, but I'm not certain when to plant them. There's so much dew in the air right now, and it's supposed to drop down to the 20's overnight. That means it's going to frost and I need to cover the Native Honeysuckles, Lonicera semprvirens, I planted. I think they'll be fine but I'm going to cover them with mason jars just in case. Spring is off to a slow start. Earlier in the week I set out my Bumblebee Boxes, and Mason Bee Nest Blocks. Bumblebee Boxes are a simple bird house with a 3/4" hole in it. A clump of fabric or "former rodent nest" makes it enticing for them to move in. Some species prefer to nest underground and for those you'll need to install a hose/tube/pipe out the front end and bury most of it. (I've found Bumblebees nesting in my garden hose before. They don't last long though. Just turn the water on and they're gone.) Place the box in an area with tall grass. The trouble is the low success rate. I read 1 in 3 boxes are successful but I haven't had any luck yet. Thankfully there are other bees that might use the box. 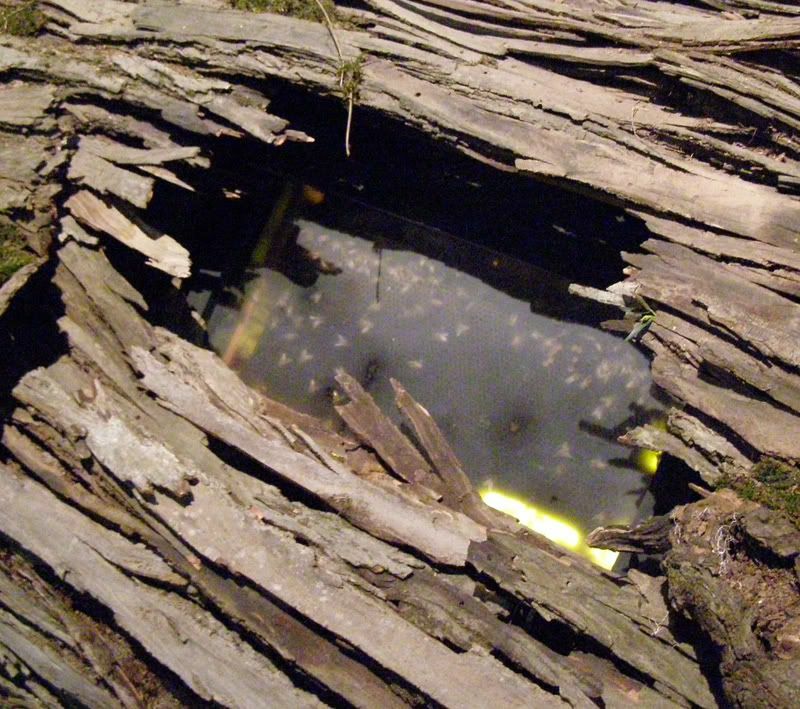 Mason Bees nest in pre-drilled holes in untreated wood. Don't drill all the way through though, they prefer one entrance. Different sized around the size 5/16ths seem to be what works. I have a nesting block of mason bees from last year. I'm going to set it out probably tomorrow or when I see my fruit trees blooming. They're a spring mason bees (only active for 4 to 6 weeks) so I want to make sure they wake up at the right time. They have plenty of nesting for this year I'm sure. Two bees from last year FILLED a block of 20 holes. Each hole probably has 5 to 7 bees in it. Today was warm enough for Prenolepis imparis to fly here but all I saw were males leaving colonies once again. I'm hoping the colonies I normally watch didn't simply favor males this year. It's been a yearly thing that I photograph the queens as they take off. Assuming the colony has queens to send out I'm assuming that it's just to dry now. The main flight of the area has yet to take place and I'm hoping it's just due to lack of rain. Normally they'd be up and out on the first day they can in or after February. I believe the moisture they need is already there in the soil as the ground thaws. In walking around the yard I found many colonies are coming out of hibernation. Prenolepis imparis is the only one that's actively foraging though. Others like Aphaenogaster and Formica are currently taking advantage of rocks and logs to warm up the colony. They sunbath (usually under the rock) and gather heat to bring back down to the winter chamber where the rest of the colony is. Another thing out in my yard, I noticed under a piece of wood I commonly lift were three colonies of ants. Lasius claviger had their underground aphids up with them, Tetramorium casepitum (species E) was there in the middle, and Camponotus castaneur nesting next to them. This is a neat combination because the Lasius here is almost completely subterranean, the Tetramorium is an invasive grass ant, and the Camponotus only forages at night. The honey bees were out today and bringing in loads of pollen. 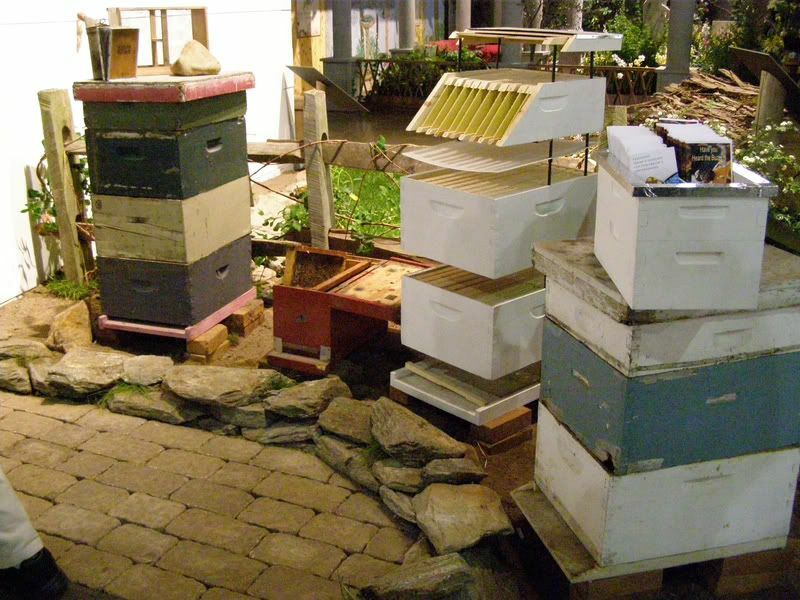 I'm happy that all 4 hives survived the winter. Now I need to see about controlling their swarming. I also saw my first Bumblebee yesterday. This early in the year almost all the bumblebees you see are queens. Though starting new queens out in captivity is tricky I don't believe they have that high of a success rate. When the trees start blooming I'll put my Mason Bees outside too. They're currently hibernating in the fridge, and I look forward to seeing them become active again. Nothing to report on butterflies yet. There was the egg case that showed up on the nectarine tree but that's probably been there since the fall. I see similar things on trees out in the woods that are commonly targeted by tent caterpillars. 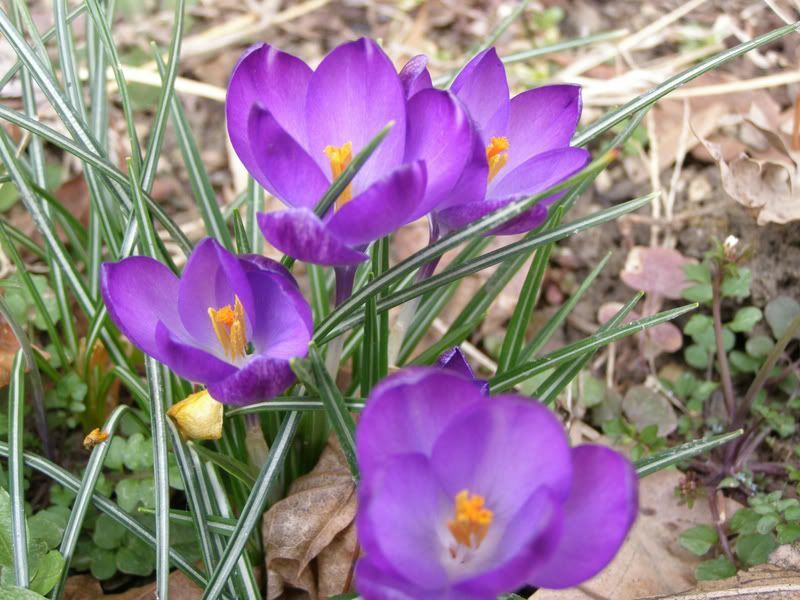 The Crocuses are amazing and blooming better than ever. The few that weren't eaten by the rodents around here have bloomed wonderfully and I even see some have divided. The Native Honeysuckle I just got in I also planted. The day started out with me looking for a place to plant them. My mom finally saw pictures of what I was trying to plant.... And then she told me I could dig up her Butterfly Bush!!!!! (Something I've been wanting to get rid of since we bought it!) So I bought her a trellis and got another one for myself, and I have planted 2 of the 3 I bought. My one remaining Honeysuckle plant will go to one of my relatives I think or friends. Prenolepis imparis should be flying all this and next month (April) but only on warm days above 60F or so. Flights usually start after noon at the earliest but are more likely to be seen closer to 4pm -5pm and last until sundown. It's best to find a colony or two of these ants and observe them at this time of day when the temperature feels right. On days when they fly it's usually warm enough that you don't need a coat but wind doesn't matter for this ant. They are a very ill-weathered ant. They'll fly in cloudy conditions with wind gusts up to 70mph. Swarms gather around trees and are usually low to the ground, sometimes above the canapy but not often. Males tend to greatly outnumber the queens too so swarms can appear as swarms of gnats. They don't fly as dynamicaly as gnats though so walking through a swarm will result in several of them landing on you, where as gnats will likely fly away more easily. Knowing what male ants look like is also handy. As you can see from the photo, queens are birghtly colored and in my opinion one of the prettiest ants you can find. There's something about the blushing red orange color of the thorax, and the blond yellows of the abdomen. As far as I know this is a unique color combination in the ants world. Workers are about 4 milimeters long. Their color is either a pale brown color or a dark almost black color. 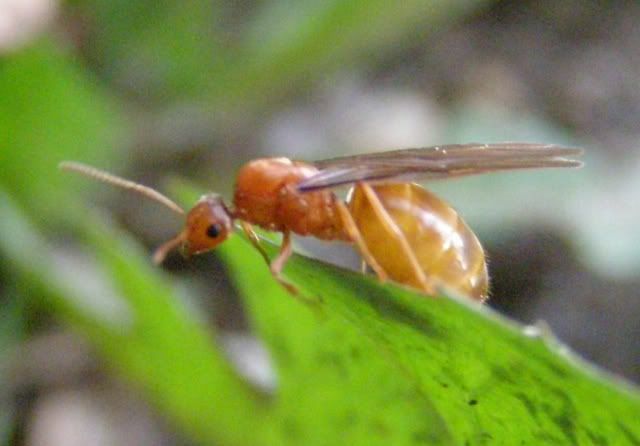 This ant is also found all over America but are most common in forested areas. I was outside a bit ago inspecting my trees. We're supposed to get a cold front in and possibly more snow so I was worried that the frost might kill the flower buds if they're to far along. 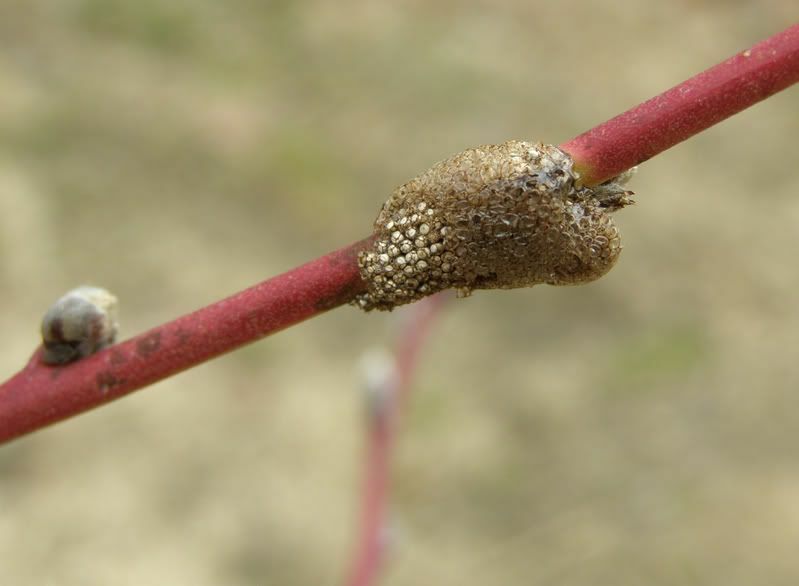 While inspecting the Nectarine tree though I found what I believe is the egg sack to a moth or butterfly. (There's an outside chance that it's a praying mantis but I doubt it.) Usually caterpillars are very specific about what they eat. Meaning they'll either eat the flower petals themselves or they'll go for the leaves that emerge with them shortly after. If they eat the leaves I have no problem with this... But if they go after the flower petals I'll be taking action. I want me some Nectarines! Apparently the crocuses aren't done blooming yet. 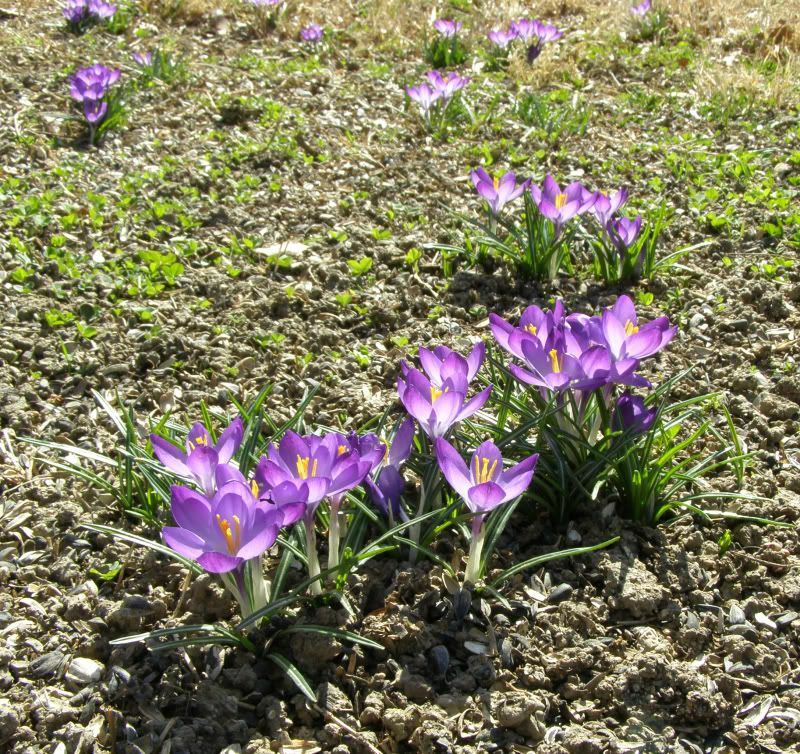 Earlier this week I had more crocuses come up. This batch was a nice purple color. Not a whole lot about ants but this is the show that started my quest to find a place for ants in the garden. Earlier today I went to work. I don't represent the company so I won't say the name of it, but it's a two story building and I work on the second floor. I'd worked the night before as well, and I've always been in the habit of looking around outside. Ants and other insects especially fly up to the lights at night and it's a nice place to be besides. So you can imagen my disgust when I stepped outside today and saw someone had dumped tires all over the forest. Just Tires. Maybe 17 of them, all thrown off of someone's truck probably and left there. Something had to be done here. First off, we're not responsibly for cleaning the forest but I felt obligated. It's like someone throwing trash behind your deck when there's a perfectly good trash can next to it. My building actually has an industrial compactor too. People are always throwing their crap in there. They're not supposed to but at least it's better than the woods. So I had some fun at least. Basically I asked the manager if I could use the cart. They asked why? and I just said "Oh I just need that one." Behind the building I went, I gathered the tires up, saw some neat egg sacks too to tent caterpillars while I was there, and I was in and out in 10 minutes. Didn't take long at all. Some of the tires had water in them from the rain last night though which was a little disgusting, but I had gloves thankfully. I threw them into the dumpster... this isn't the proper way to dispose of old tires but it's a lot better than being out in the woods. Especially a place I commonly photograph nature. Bringing the cart inside, my manager caught me sanitizing the hell out of it. In a confused bit of laughter he asked, "what are you doing?" I said, "I'm cleaning it off." ... and that's all that was said. Just a reminder, the Great Sunflower Project is drawing close to their shipping date. So if you plan on joining please head over to their site and sign up. If you've already signed up then they're asking you log in and confirm your address. I just did this for my account moments ago... they say remember to his submit. I have to say I did and it didn't seem like it did anything. There was no "Congratulations You Did Everything Correct," or anything like that. So we'll see what happens with getting seeds. I have already picked up a packet the sunflower seeds they'll be using this year, Lemon Queen Sunflowers (annual). It's not a variety I've ever grown before but looks nice. I'm hoping the yellow of the petals isn't as pale as I see it from pictures online. On another topic, you may notice you like having pollinators coming to your yard. If that's the case then be sure to visit www.pollinator.org. They have a planting guide for pollinator gardens and a broader range to pollinators than most sites that deal with the topic. The only problem I found with it is I had no idea what guide to click on. There are 4 for California alone and all the others are named oddly. Using their zipcode code search cleared up any confusion though. A brief look at 3 species over the year: Prenolepis imparis, Formica neogagates, and Camponotus chromaiodes. 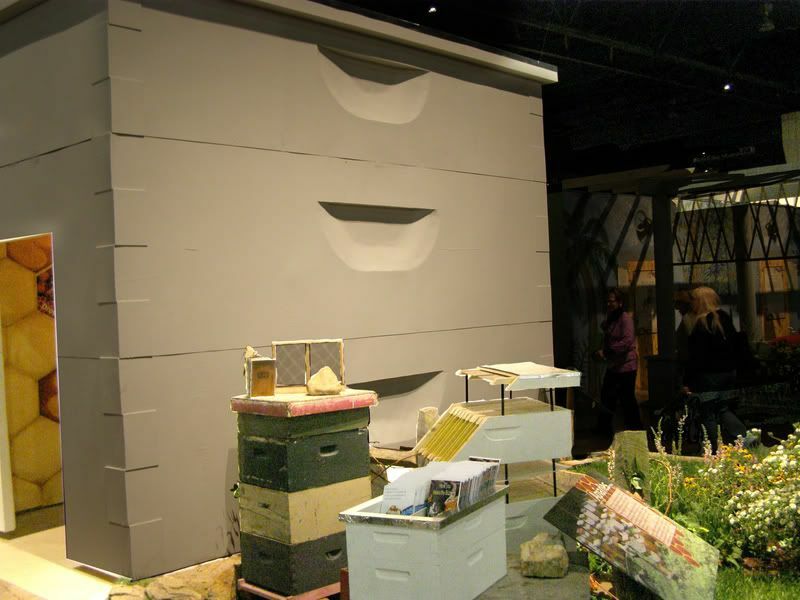 An exhibit that really caught my eye as a beekeeper was presented by The DCTS Landscape Program and The Chester County Beekeepers Association. It's shaped like a giant beehive! 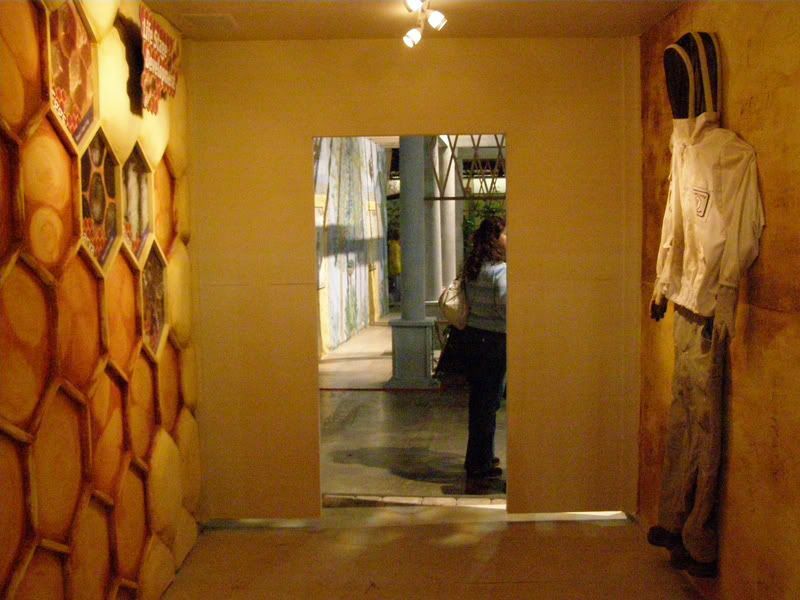 Inside was an educational display of a bee suit and some nice photographs. It was all very well presented. They get a big A for effort. But the information wasn't quite there. There could have been more but I suppose it's a great thing they didn't make it text heavy. Even so, I was still over joyed to see this. Outside were nice displays of beehives. There were some plants behind these too but sadly my pictures of them didn't turn out. (I had that problem all over the show.) Black-Eyed Susans were one of the plants that I recall. asked about "what does a beehive look like" or "how does it work?" The larger boxes here (in the middle) are called Deeps. A new package of bees needs just one of these to live in. Eventually you'll have to add a second Deep on top of that. After that though you add smaller Supers, the small box on top of that. Regardless of how boxes you have though there's always a bottom board (the lowest part) and an inner cover, and telescoping cover (top). The plastic bit between the Deeps and the Super is a Queen Excluder. This is optional. The queen bee will lay eggs in the middle of all these boxes and surprisingly maintains a sphere within the boxes. She rarely moves up above the two Deeps but occasionally she'll move up to the super. Queen Excluders come in handy becuase you can't take honey from any of the frames that have brood on them. There was also a small observation hive there. However, I wasn't impressed. 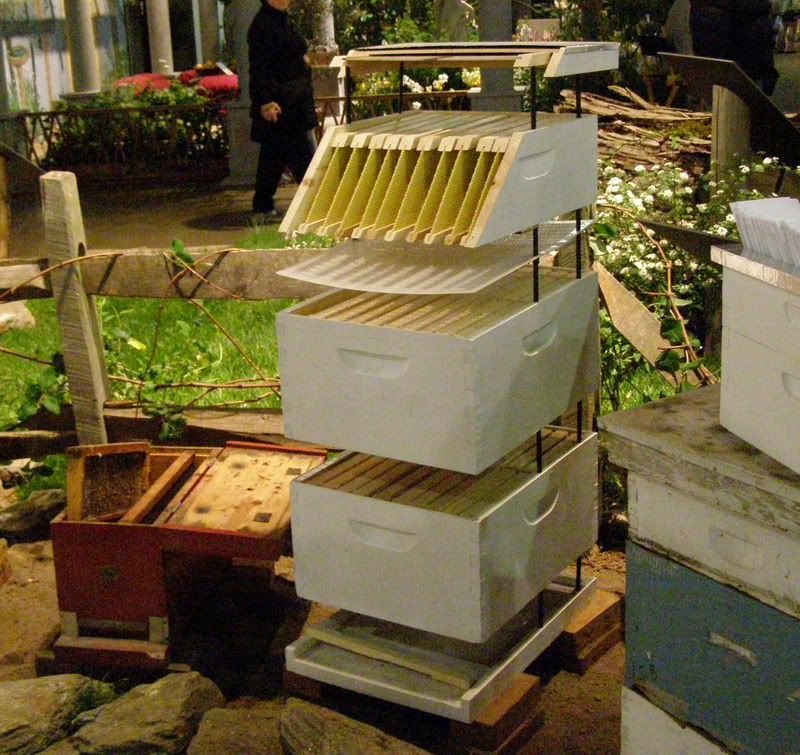 The only frame on display had no honey on it, no brood, or anything. There were just some bees in there. 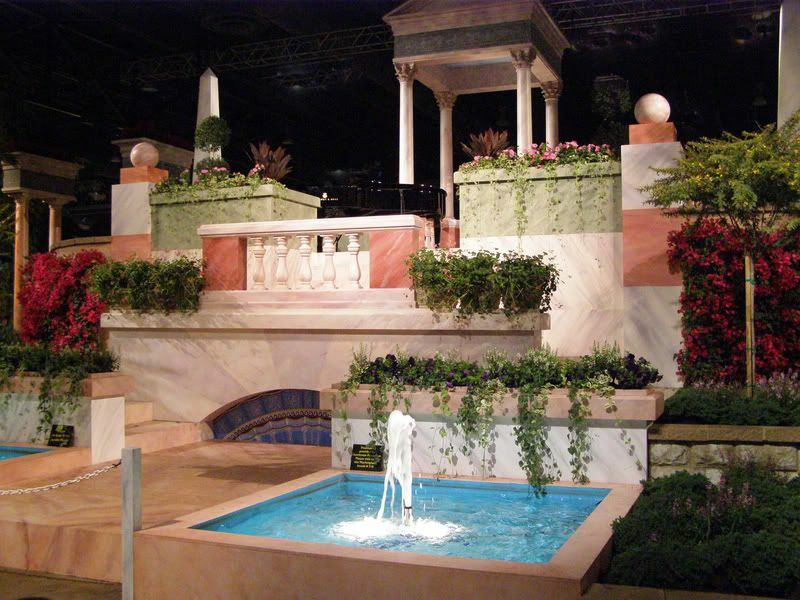 Other Philadelphia Flower Show Exhibits were a great mix of what I'd call achievements of landscaping. The fact that they can wheel in all these plants and trees (20 feet tall!) and get them all to bloom at the same time. Some exhibits had bits of humor to them. My pictures probably don't do justice to the show itself so go see it while it's still here! One thing I learned the hard way, If you're taking the Speed Line or Septa to 5th and Market then you actually don't need to step outside to get to the show. Walk to the other end of the mall and make your way through The Gallery and up to the Convention Center. There is a lot of walking involved there but at least you're inside. 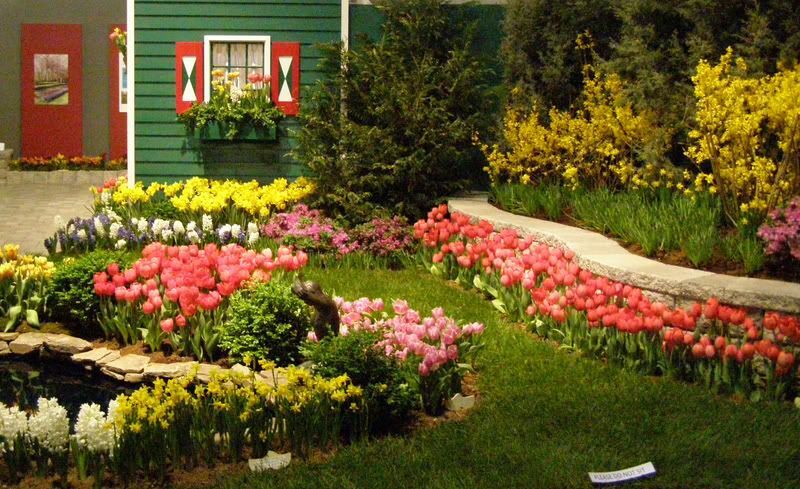 The landscaper here clearly loves bulbs. I enjoy bulbs too but only becuase they usually bloom early in the year and they're the only thing of interest out in the garden. They did a nice job. 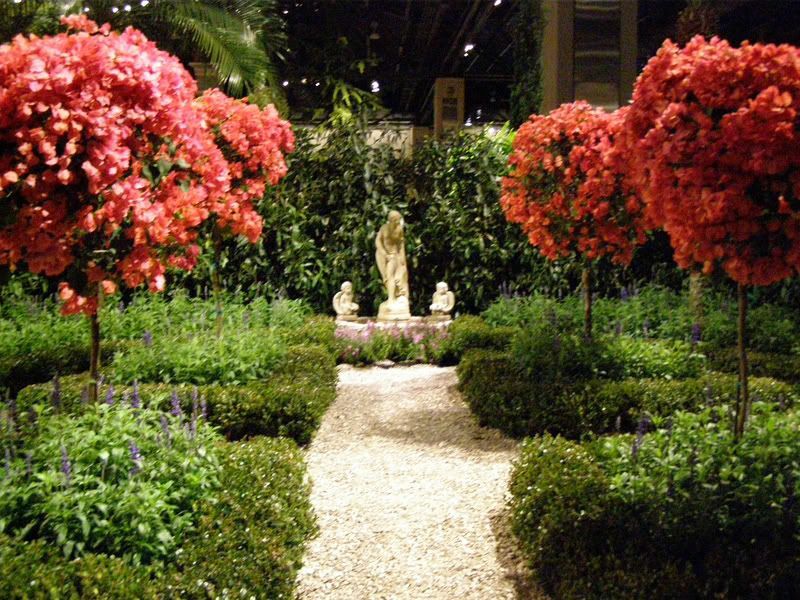 Mixed Rhododendrons and Azaleas aren't plants I used to like. But after seeing this display I can really see how they can be used well. It's almost like a field of wildflowers. I know some are native to the US so maybe I'll look into getting some. 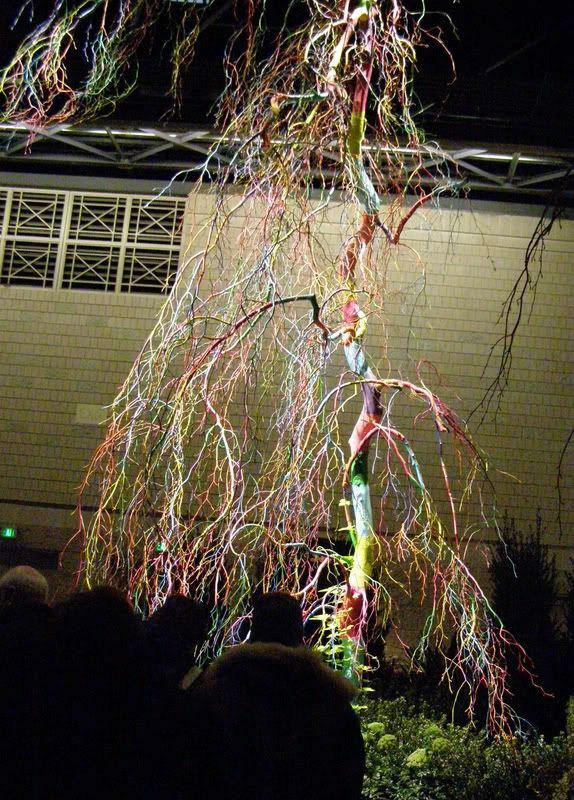 This was a neat tree. Below it was a black pond that reflected the colors beautifully. 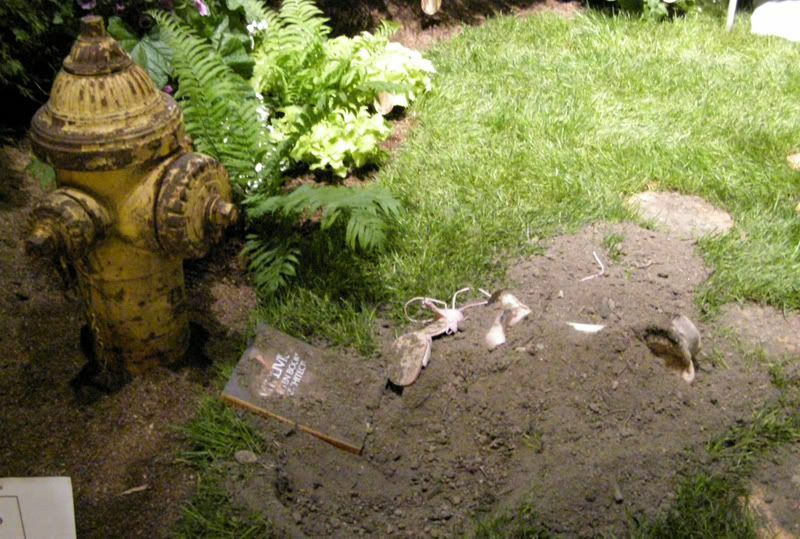 The effect is a little lost here with all the dirt but that's a dog bone and a women's shoe there. There was a dog house here and it had the name Caesar on it. A joke about the Italian theme. This was a door to nowhere. I like the colors, especially for the trees. 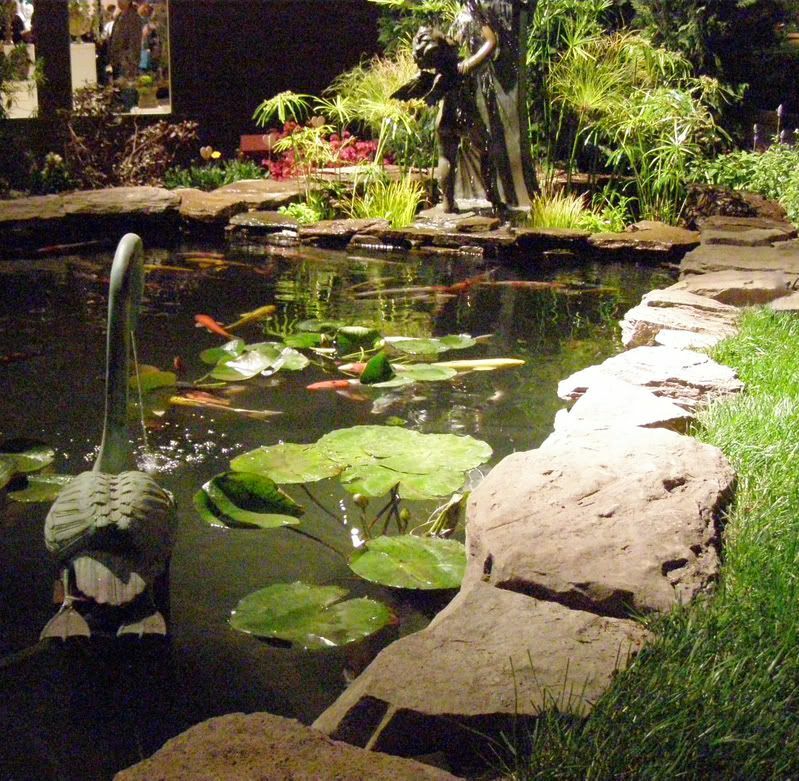 This was a Koi Pond with some very nice fish in it. They're usually sold for more than $20 each and despite being gold fish you can eat them. One of the more interesting gardens I think. They used seashells as the walk way... not something to walk barefoot but I think structurally it was well thought out. I really like the pond here because it has some sort of green ... I suppose some sort of tiny lily pads growing on it like a slime. The effect is something I wish my pond had. 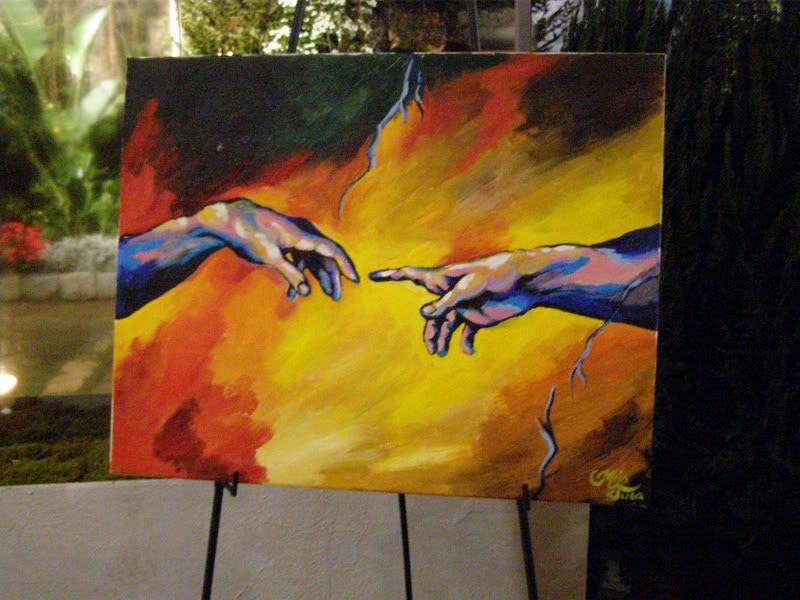 One of the exhibits featured paintings. Though not incredibly original they were done well. Other paintings included replicas of The Mona Lisa and Michelangelo's David. The picture I took here doesn't do this justice because it was one of my favorites. I love the stone walk way with the various plants growing around it. 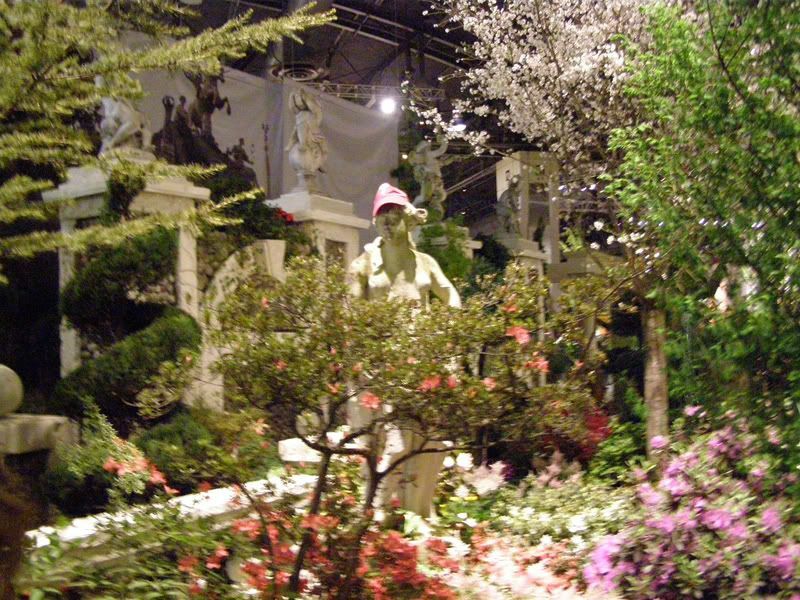 It was one of the few exhibits to feature some tall trees (if I recall right), and they used more than just bulbs in their display. This was so ugly I just had to take a picture of it. 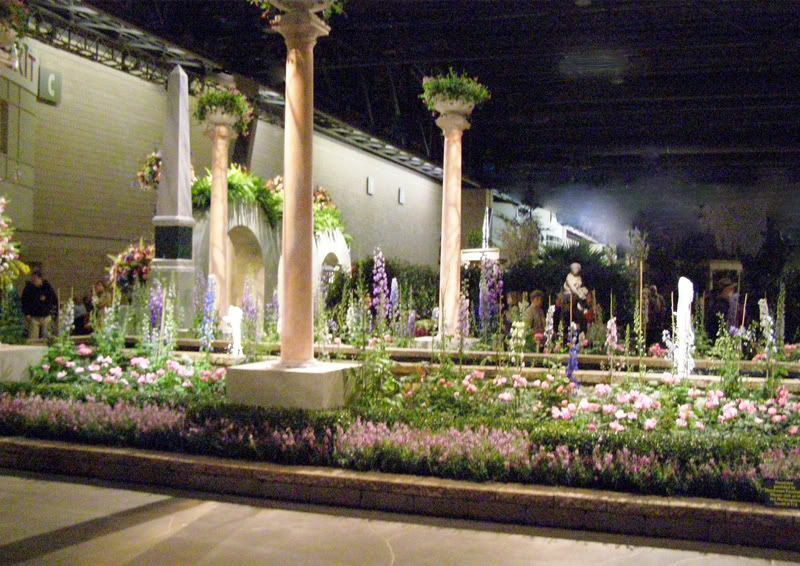 The exhibit here wasn't incredibly ugly or a failure by any means. It has lots of Orcids all over it growing along walls and in pots and so on. 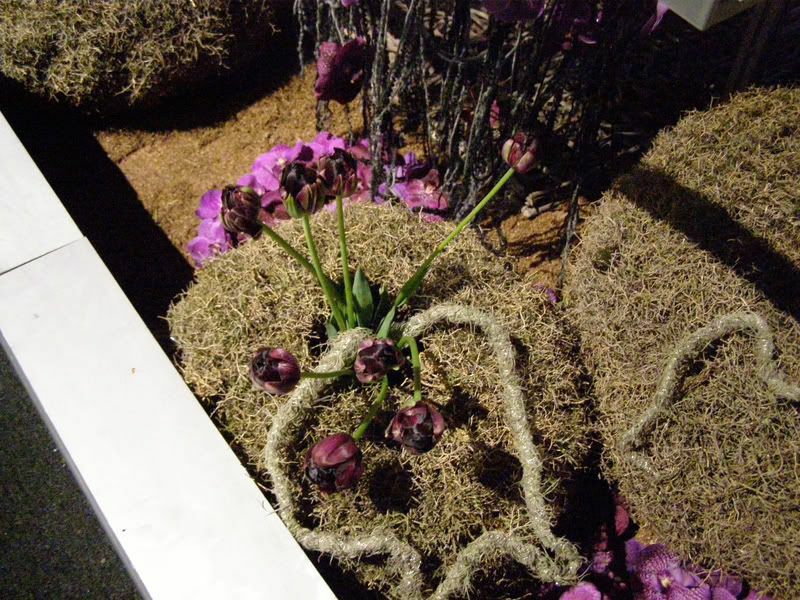 But it featured these bushy thatch or moss clumps all over it and had these black tulips growing in them. The two ideas really didn't go well together. Many of the plants were under glass but they were also using plastic water bottles under them with light shining under it. I serously didn't get it at all. I assume it was trying to say something about sustainability and recycling... but then why have all the Orcids and ugly Tulps? Another favorit of mine. 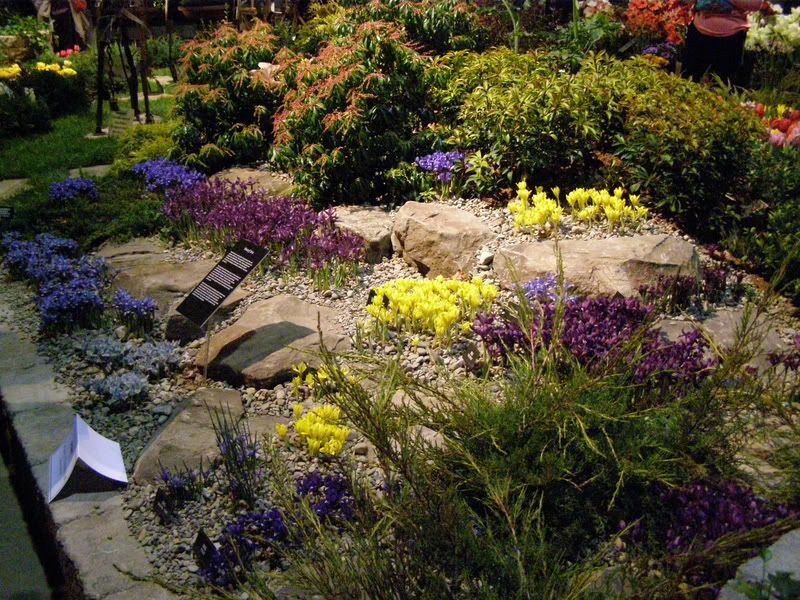 The colors worked well together and the plants might even bloom around the same time. Yellow Crocuses mixed with assorted Irises. I could really see this working out in real life. There were also smaller exhibits there that were entered by people. I didn't really pay attention to these but I liked the consept. 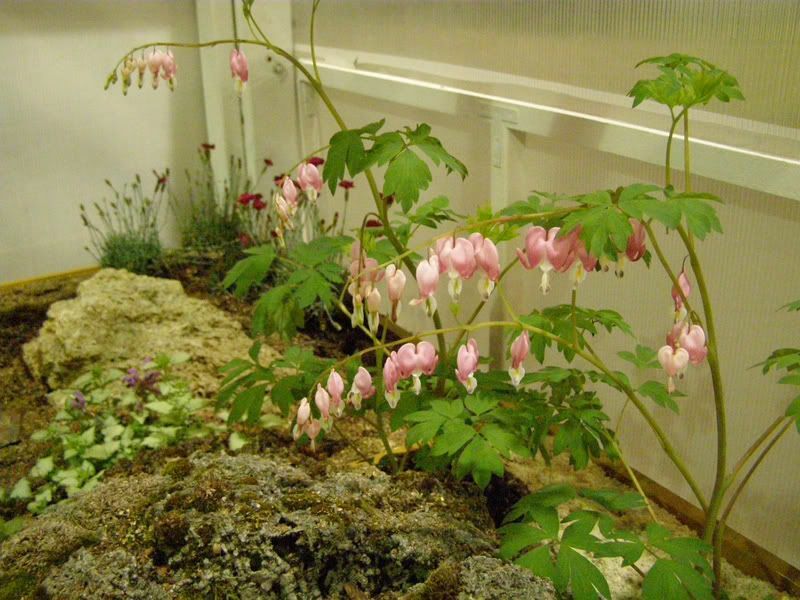 All the plants used for these were small enough to accuratly represent a model of perhaps a larger plant. 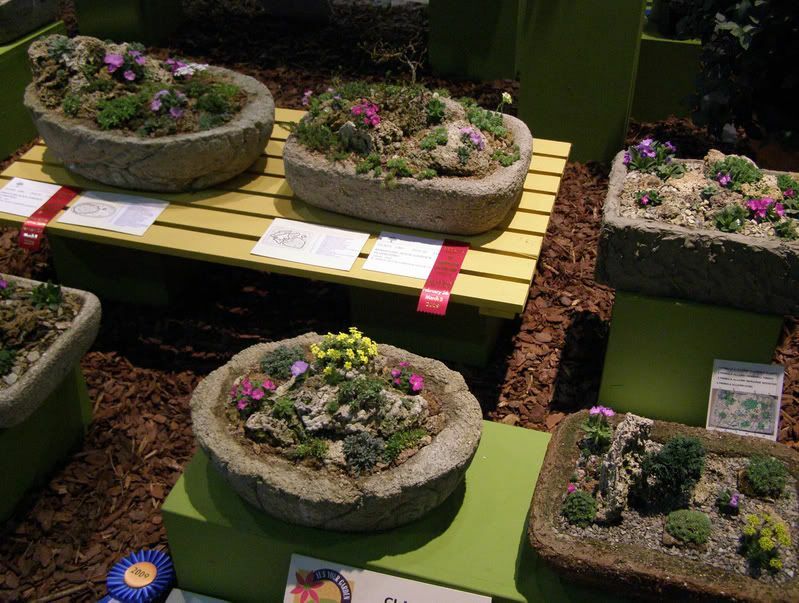 I suppose you'd have to call these tiny rock gardens. These also caught my eye. I really like the use of these tiny plants. 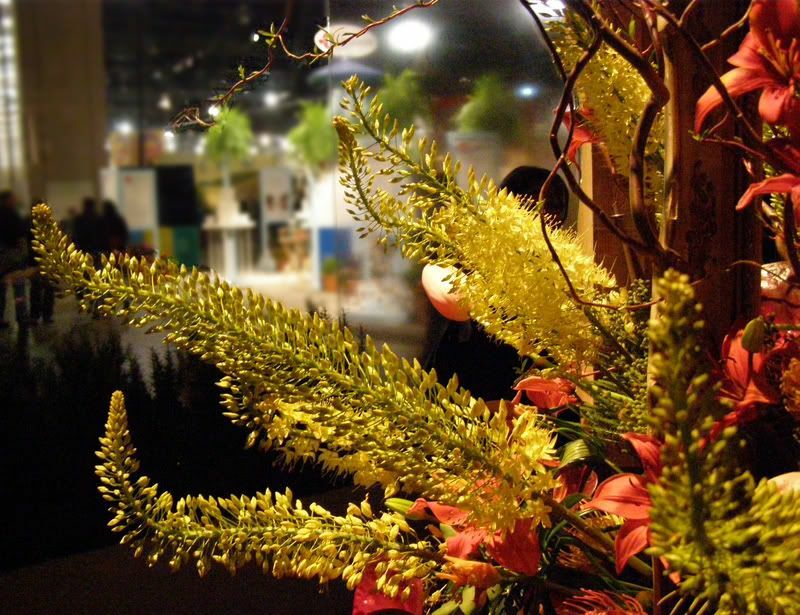 Foxtail Lily, Eremurus, seen here in yellow, is a plant I had my eye on at last year's show. bought a bulb of it but sadly it didn't bloom. In fact the dog got it and chewed it up pretty good. These bulbs have 4 to 8 leading roots coming off of them and are very sensitive about them breaking. This year I bought 2 bulbs at the flower show for a great deal. Though not native I look forward to hopefully seeing them bloom later this year. A bulb that goes almost completely unused in the garden is our native Trilliums. And though not a prize winner Trillium grandiflorum was the clear winner in my eye here. Sure it's not as tall as the others but at least you can see the flower. I was assured that the other 3 plants here (that did win awards) were flowering too but who can really tell. The petals are a very dark red color and don't resemble flowers at all. The only thing they really had going for them, and probably why they won, was because of the foliage. 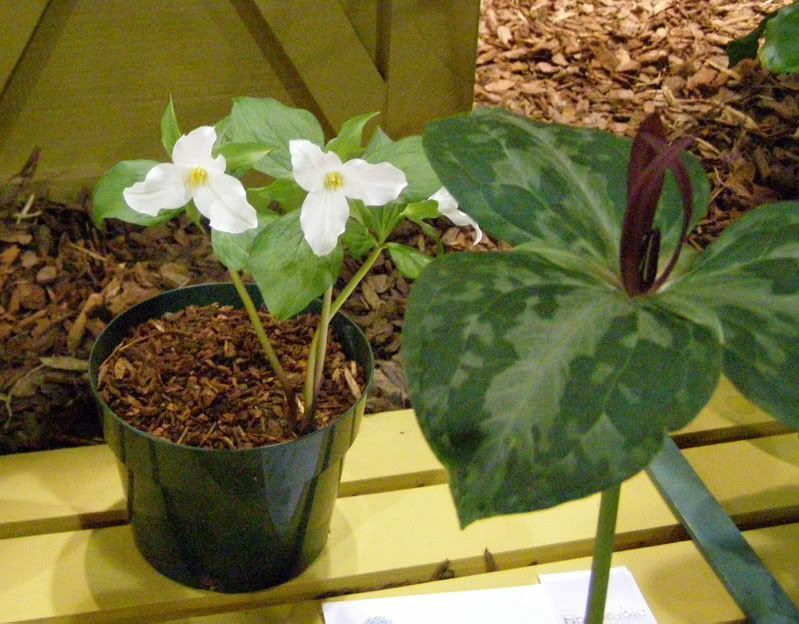 Trilliums slowly form colonies in shady areas, usually under deciduous trees in semi-acidic soil. I have to admit in a group the other three probably would look nicer growing around the base of a tree. Here is a better comparison of the foliage and the flowers. What sunflowers have to do with Italy is still unknown to me but they were present and I only regret not taking more pictures of them. 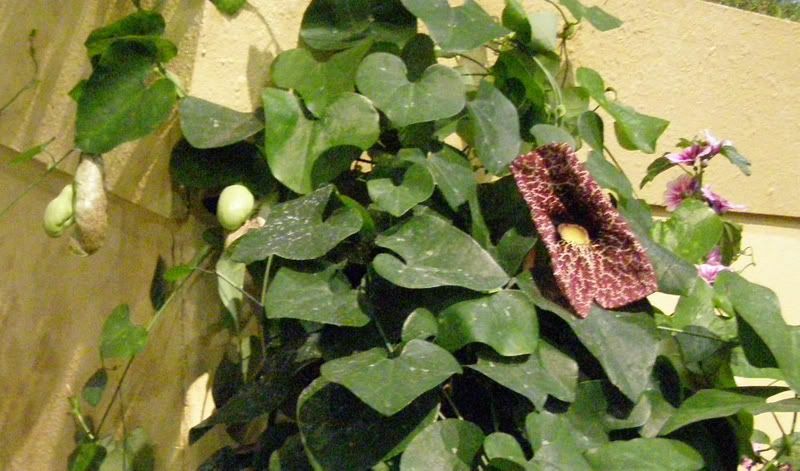 Dutchman's Pips, Aristolochiaceae, is a native vine that grows some interesting flowers. It's also the host plant to the Pipevine Swallowtail Butterfly. I wish that this plant had more of it's flowers on display instead of just the one. 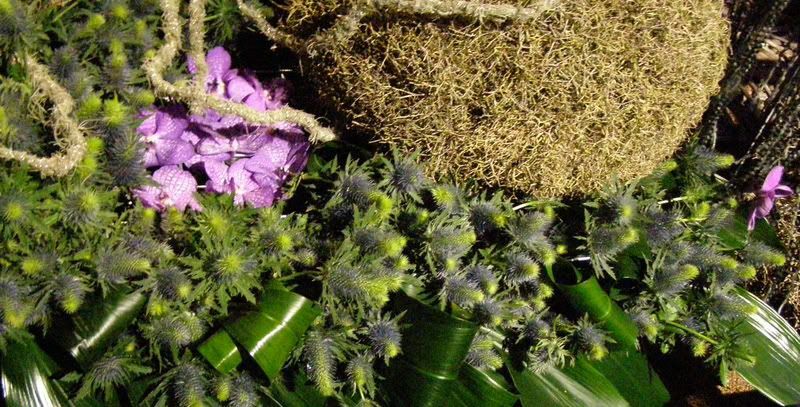 Here someone used loads of Sea Holly flowers. It's a plant I currently have and enjoy. Despite the thorny look to it, it's not a sharp plant at all. This variety used also isn't as blue as they come. Bleeding Heart, Dicentra, was another great one. I tried to grow this last year and failed. But I shall try again because this plant is just so interesting. 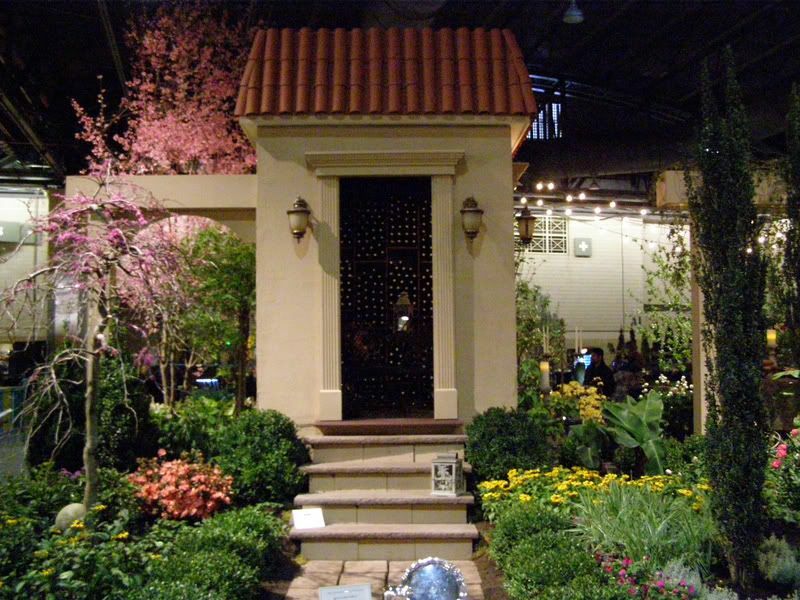 Despite 10 inches of snow I still managed to get over and see the Philadelphia Flower Show yesterday. This year's theme was Bella Italia. Looking at their brochure though one wonders what Sunflowers have to do with Italy. Thankfully these American natives weren't used to much in the Italian theme. I twas right to go at the time I did. 10 inches of slow mean schools would be canceled and more than half the people who take the speed line would call into work sick or snowed in. Sure enough I was right. At the show there was relatively few people walking around. No line whatsoever to get tickets. And there were happy gaps in the crowd that allowed for me to take loads of pictures; some of them good even! Just as last year, when one walks into the room you overpowered by the smell of pollen. However it this year it was weaker and didn't linger through the show at all. The sheer work that goes into creating the show is breathtaking. This had to take more than a full week to achieve. 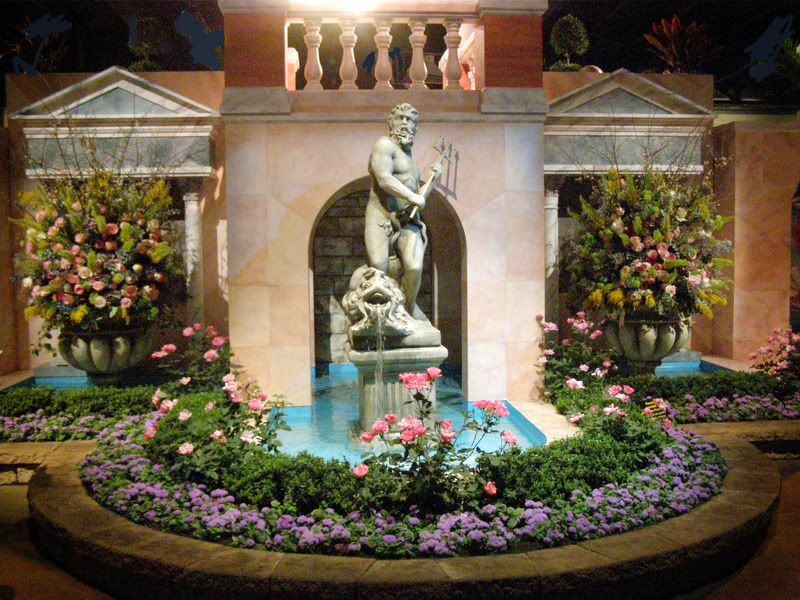 Statues of Poseidon and other Greek Gods were all over the place. Huge pillars of heavy stone lined a fantastic fountain right as you walk in. And all along it were flowers and trees mostly in full bloom. The timing for the plants in general had to be done carefully. 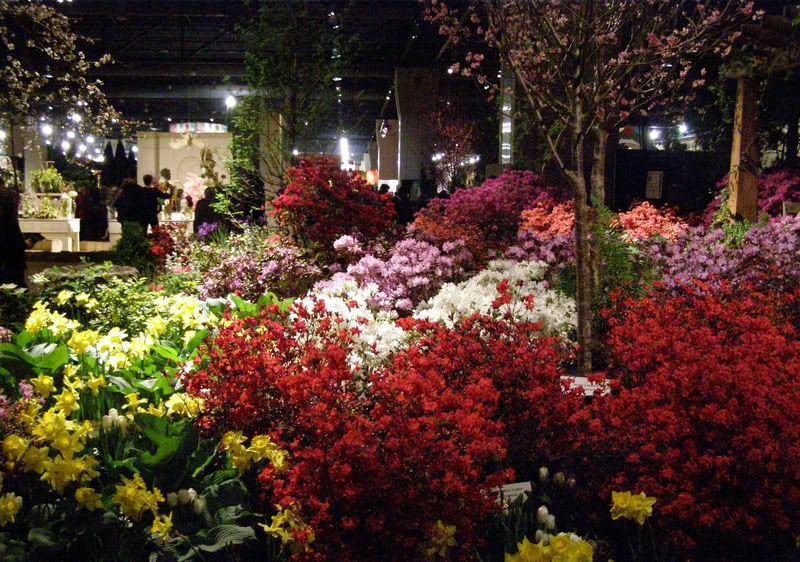 Each type of plant and variety flowers after a different amount of cold hours. 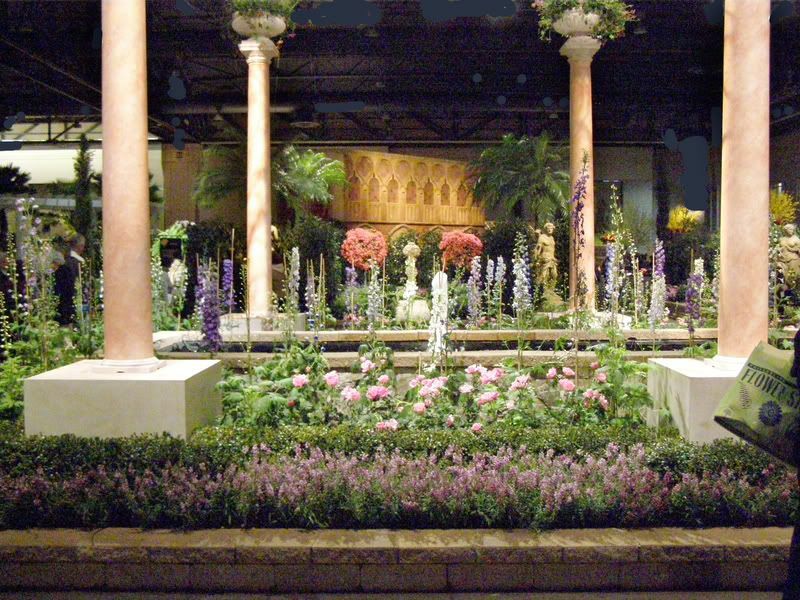 The main pond featured numerous water pillars that went well with the Delphiniums blooming beside them. Other plants I didn't really recignise but they were there mostly for color. All the way at the end of the pond was a stage where opera singers preformed all day long. I enjoy classical music but opera isn't something I stop for like so many others. 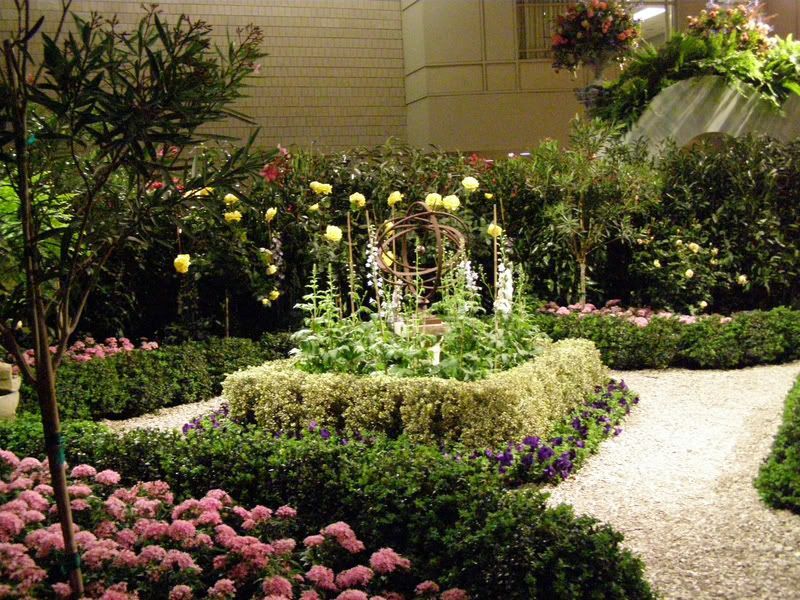 To the sides of the pond were little gardens that didn't have as much emphases on color. It was all about texture here to go with the statues. Not the best photo I took but someone placed a Phillies hat on this statue and it was drawing a crowd and laughs. I'll be back to post more later on. Chicago Public Radio had someone on today talking about Honey Bees. I found it to be very enjoyable and learned some things too. Dr. Gabriela Chavarria is an excelent speaker on the topic of Colony Collaps Disorder and she explains the politics involved when it comes to bees. Apparentl CCD has been solved in Europe, they banned products from the company selling the insecitcides responsable. But because the research wasn't done in the U.S. by the company itself!!! we can't use their findings. Give it a listen here. I just got done watching this movie and I have to say it was a huge improvement over the other movies they made. I'd say it's by far the funniest and most enjoyable of them all. As the title suggests, it has an environmental message. The writing towards the end was a little laze and all the characters were jumping around a bit though but that's it's only real fault. As usual with the Futurama movies they're written so they can eventually be broken up into "new" episodes later on (usually 4). Originally the makers were only contracted to do 4 movies but after watching this one I certainly hope they renew and do several more! This series had so many more places to go than The Simpsons. The DVD is worth the money in my opinion.